The truly world-wide reach of the Web has brought with it a new realisation of the enormous importance of usability and user interface design. In the last ten years, much has become understood about what works in search interfaces from a usability perspective, and what does not. Researchers and practitioners have developed a wide range of innovative interface ideas, but only the most broadly acceptable make their way into major web search engines. This book summarizes these developments, presenting the state of the art of search interface design, both in academic research and in deployment in commercial systems. 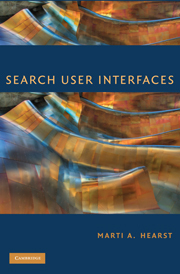 Many books describe the algorithms behind search engines and information retrieval systems, but the unique focus of this book is specifically on the user interface. It will be welcomed by industry professionals who design systems that use search interfaces as well as graduate students and academic researchers who investigate information systems. 1. The design of search user interfaces; 2. The evaluation of search user interfaces; 3. Models of the information seeking process; 4. Query specification; 5. Presentation of search results; 6. Query reformulation; 7. Supporting the search process; 8. Integrating navigation with search; 9. Personalization in search; 10. Information visualization for search interfaces; 11. Information visualization for text analysis; 12. Emerging trends in search interfaces. Cambridge University Press is not responsible for the content of external websites.